This beautifully presented holiday home is in a spectacular location, situated on the highly sought after Eastern Esplanade in Broadstairs, across the road from the sandy beach at Stone Bay. There is a fabulous sea-view from the lounge which changes every day and invites you to explore this beautiful coastline further. Close by you will find Viking Bay, a very popular sandy beach which is just minutes from the High Street. Charles Dickens said "The long sandy bay, cliff top promenade and boardwalk make this bay a timeless thing of beauty." The apartment has been decorated to a high standard with holiday makers in mind. Another benefit of staying here is that this property is within easy walking distance of Broadstairs' town centre and all its restaurants, shops and places of interest. Broadstairs has a vibrant music scene which really takes off during February's Blues week-end and the internationally famous Folk week in August. Throughout the year a varied calendar of events suits all tastes and ages. There is a private entrance door to a storm porch, lounge/diner with Sky TV (basic package), fully fitted and well equipped kitchen, two bedrooms, one double, one twin and bathroom with a double shower, with toiletries included. This property has been designed to comfortably accommodate up to four guests. There is free Wi Fi and gas central heating. Children over five can stay by arrangement. Currently there is no cot or high chair available. Pets are not allowed. A £200 deposit is required. Please note there are steps to the front door and it might not be suitable for people with mobility issues. The apartment is not wheelchair friendly. Strictly no smoking allowed. A luxury welcome tray will be provided as well as a fully equipped kitchen and bathroom toiletries. The price per week will vary according to the time of year. Please contact us through HomeAway to ask about discounts available for longer stays and special off-peak weekly rates. My name is Vicki and I am the managing booking agent for Seaview. 48 hours prior to your check in, I will email you with all the details of your stay including access codes and relevant telephone numbers. If you require any local information with regards to services please feel free to contact me, I am always happy to help and ensure your stay at Broadstairs is an enjoyable one. Fantastic flat in a great location overlooking the sea. We had a great week, staying for the second time in this flat. It is in immaculate condition with everything you need for a holiday. The flat is overlooking the sea and only a 5 minute walk into town. Parking is generally easy though Broadstairs can get busy at the weekend. Accommodation was good but there was no bedding or towel change for the 2 weeks we were there, but in excellent position in broadstairs,however we were unable to get BBC iPlayer on the rather small tv. We had a lovely holiday here. The apartment is in a great location just a few minutes walk along the clifftop and within easy access to three beautiful beaches at Viking, Stone and Joss Bays so we had peace and quiet even during Folk Week when the town can occasionally get noisy, yet we were within a few minutes away from anything we wanted to do. The property is in immaculate condition unlike some self catering homes. Beautiful views across the sea from the lounge. We would definitely book again. The flat is very nice and kitchen very well equipped. Car parking is not a problem and the beach is very nearby. The location can't be emphasised enough. A few hundred yards from Stone Bay - an expansive sand beach. The flat has a sea view. But properties can have a great location but once you walk through the door....! Not here. Refurbished to a high standard, bright, comfortable and has that 'coastal' feel. The owners have thought of everything to make your stay comfortable & enjoyable. lots of guides/leaflets to local amenities eyc. Comprehensive info on all appliances. We stayed in some properties where you are supplied with 3 electric coffee makers and no potato peeler - and that was in Ireland. We weren't short of anything in the kitchen. Overall, well recommended. We stayed there for two weeks and we were very satisfied. This lower floor apartment itself is quite new, clean and comfortable.They look after every detail. Big kitchen though the table is in the living room( from where you can see the sea) and very nice bedrooms , very quiet as well not noise at all. It's just opposite the beach so you can go jogging nicely in the morning and in a 10 min nice stroll you are in the centre of the village, which is quite nice as well. Besides, the lady from the agency that manages the apartment, Tracey,is very nice and efficient . No time problem at all with receiving or handling in keys either. We are pleased to hear you enjoyed your stay at Seaview and we would like to thank you for your comments. 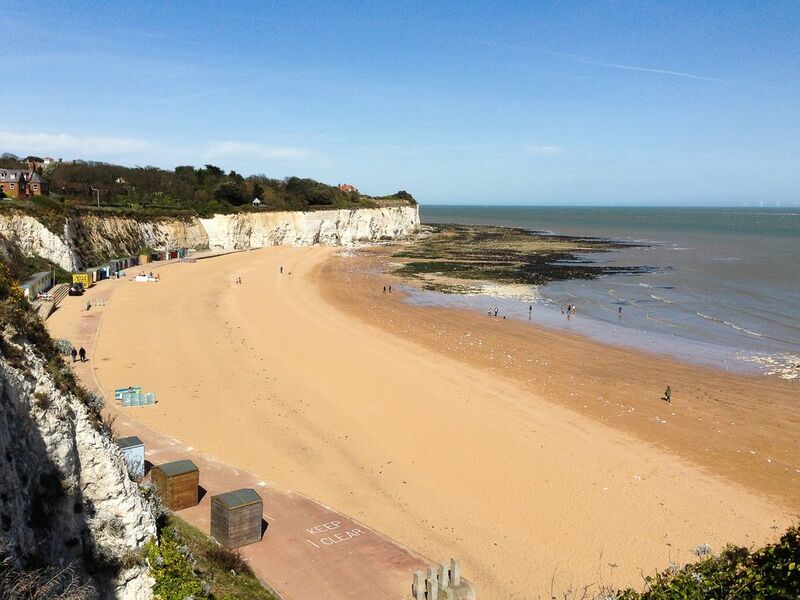 Explore award-winning Blue Flag sandy beaches; a delightful range of independent shops in the traditional High Street and cliff top walks to neighbouring Ramsgate and Margate. Enjoy literary, culinary and musical festivals, watch the latest films in our gem of a cinema and live theatrical and musical performances in the thriving community theatre, and pubs. Dine in a wide variety of restaurants and bars. Broadstairs Town has everything for a delightful stay - at any time of the year. Bookings start on a Friday afternoon and end on a Friday morning. The only exception to this is during low season when there is more flexibility. If in doubt please enquire.